As a Noughties reality TV star, Kelly Osbourne could not have seemed less interested in conforming to fashion trends. She gave herself punk hairstyles, wore unflattering clothes and covered her face in eyeliner - just like thousands of other teenagers. But what a difference seven years makes. The pretty singer has now successfully transformed herself into a fashion icon. And it looks like she will soon be cementing her stylish reputation as a judge on Britain and Ireland's Next Top Model. Fashion TV shows are nothing new for the 29-year-old, she presented Sky's Project Catwalk for all three seasons of the show. 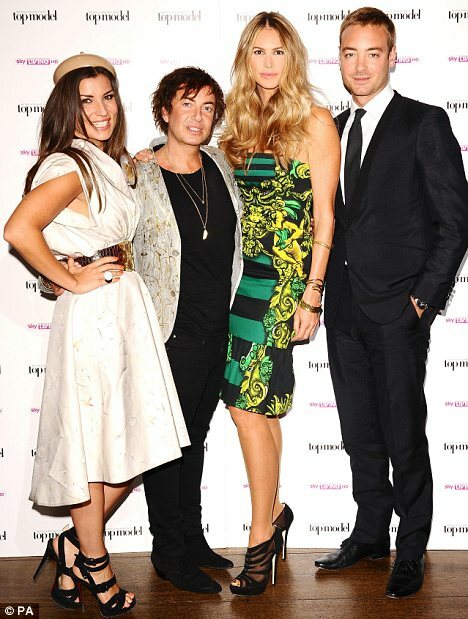 But working on BINTM would place Kelly on the same panel as industry heavyweights Elle Macpherson and Julian MacDonald. A BINTM source told The Sun: 'The plan is for Kelly to come on board and shake things up. She is a massive fan of fashion and has good pedigree working on fashion shows. But Kelly's appointment would put an end to either Grace Woodward or Charley Speed's two year stints on the show. Grace became better known for her trysts with The X Factor's Matt Cardle than her styling this time last year, and Charley's profile is no longer what it was in the Nineties when he was modelling for Calvin Klein with Kate Moss. Kelly, on the other hand, is becoming more and more popular with viewers. She shares her mother Sharon's qualities of being brutally honest but also having a not very well concealed soft side. She would not take any nonsense from BINTM's famously volatile contestants but could give the often young teenage stars invaluable advice about growing up in the spotlight.